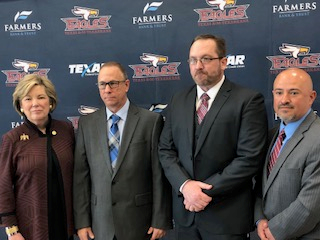 TAMU-T President Dr. Emily Cutrer, left, is photographed with new Eagles' basketball coaches Charles Goar, Kevin Dobbs and Athletic Director Michael Galvan. Texas A&M University-Texarkana’s athletic program already had a University of the Southwest flavor. Now two former University of the Southwest (Hobbs, N.M.) basketball coaches have joined the Eagles’ ranks. Charles Goar and Kevin Dobbs are TAMU-T’s men’s and women’s first-ever head basketball coaches, respectively. Athletic Director Michael Galvan introduces Texas A&M University-Texarkana’s new basketball coaches at press conference Monday at the University. Goar and Dobbs were introduced Monday during a press conference at the school’s gymnasium. TAMU-T Athletic Director Michael Galvan, who also came from New Mexico to Texarkana, made the introductions. The 55-year-old Goar has experience at all levels of college basketball, including five years at University of the Southwest. He did not coach the Mustangs this past season. Goar’s last team in Hobbs was during the 2017-18 season, and his team was 13-19 overall and 7-10 in the Red River Athletic Conference. Texas A&M University-Texarkana’s new men’s basketball coach Charles Goar is interviewed by a local television during Monday press conference. Goar has already offered Texas High senior guard Kyle Wright, and six other players from around the country scholarships. 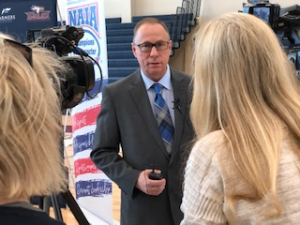 He indicated the Eagles’ first season in basketball would be very competitive if those seven sign with TAMU-T. Goar also noted it’s difficult finding talented players with height at the NAIA level. He really liked a Sulphur Springs player, but it appears that youngster will be playing at the NCAA Division I level. Goar is married, with a 15-year-old son, who will be attending Pleasant Grove and playing basketball. 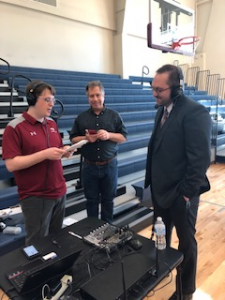 Michael DelGiorno and John Williams of Fox Sports Texarkana interview Texas A&M University-Texarkana’s new women’s basketball coach Kevin Dodd. Dobbs, 48, says the women’s program will get all of his attention. Like Goar, he has already talked with some area coaches, including former Texas High and Liberty-Eylau coach Robert Cochran. Cochran is now head coach at Longview High School, and is hopeful one of his players could be bound for TAMU-T.
A native Nebraskan, Dobbs played basketball in the NAIA, and also had coaching experience at all college levels. He was the women’s head coach for three years at University of the Southwest. “We didn’t have a lot of success those three years, but back then we didn’t have much scholarshop money either,” said Dobbs. “We’re hoping to have a very competitive program here, and I’m excited to watch things grow. 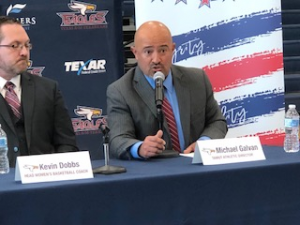 Galvan indicated there was considerable interest in both basketball programs from local and area individuals who left home for college and now want to come back.